I am one happy lion. This is Adela, a character from the cast page of Tina of the South dressed up as one of Sitala's tribe. It's not her normal outfit, but damn... it is amazing. And a character of mine, Riposte. Nice. Assassin creed ish and love the coat. Very neat pics all around. Oh Wryter, you and your never ending rockstar fetish. Isn't that what a fetish is? Avencri's one for me. I asked him to draw me anything he wanted to in particular, and he showed me a specific character. I really liked her design/story, and so while we were talking he managed to finish it up. I like it quite a bit! Eh, who knows. I don't want to call it that though. >__> it's just me being a fan of these certain musicians, but in my own way. Oh my! She looks amazing in that outfit. Out of curiosity, is there a back story to this OC? Nothing appears on the Cast Page. XD Ferret Assassin. That's just too funny. Oh yes, the musician guy. Very nice combined selfie look. Also, I wouldn't consider it a fetish per se. You just happen to like the artist. No harm in that. On all the sketches, stellar job on the amount of detail in the attire there. Since Ghostbane doesn't post. Here is his. This is my sketch from April. It's of my new persona/Pathfinder magus, Urien Lævateinn. Cryomancer, osteomancer, duelist, connoisseur of beautiful feline ladies. And this is My sketch for May. A gift for Omega Wolf J. Mine this time around was Easter Angel. Here is a certain familiar squirrel bringing animals she found back home to the bordello again. In this case a particular lynx lamb! Ussually when someone pets my fuzzy belly I return my affections by clawing the limb they are petting me with but I was immediately distracted by the dangly ball thing she waved around in my face to play with. (she's smarter than she seems). unfortunately I couldn't remain there very long, after the first 5 "incidences" or so, there was some talk about bordello's and sneaky wild animals conditioned to attack dangly balls, not mixing well together. I found a creature even odder than me! and she has a very alluring big tail just asking for my affections to be inflicted upon it. behold her tears of joy at being so adored by me. I'am also multitasking, see.. i'am one of those kitten "hang in there" motivational images too. [DOUBLEPOST=1400416340,1400409797][/DOUBLEPOST]putting aside my silly Rp-ing. I goddamn LOVE these sketches and I am happy as all hell with them <3. I love the touches Avencri put in himself as per how his own characters would behave. I just love it, the art is splendid, the situations are well conveyed and Lynx lamb is amazingly rendered. Don't kill me...don't kill me....DON'T KILL ME!!! Kidding aside, I enjoyed this piece, especially with that eye shock wave going on there. Also, I had no idea armadillos were that strong. 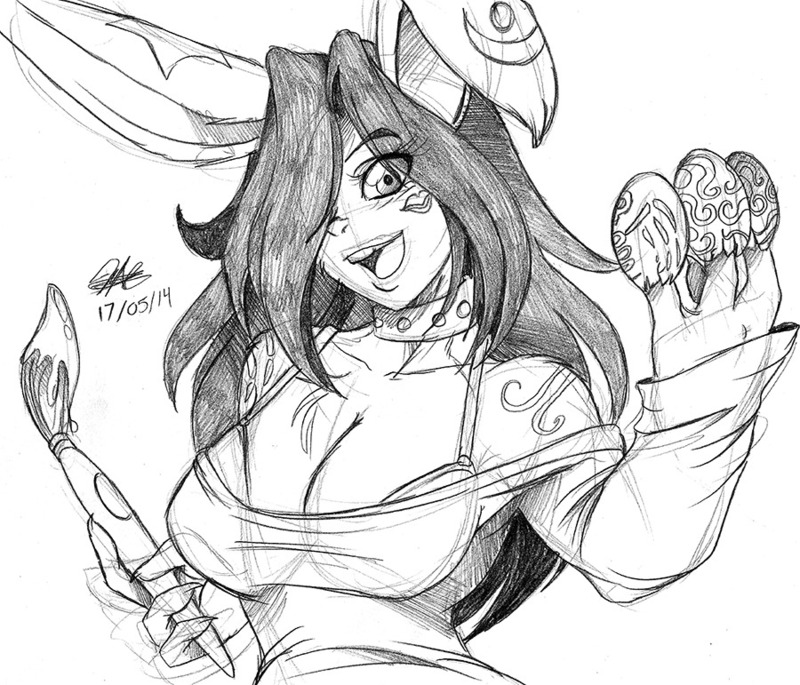 This was my Patreon sketch for April. My Fluffling warrior lady Moika (was an adoptable I purchased a long time ago). My apologies if this is necrothreading; however, I didn't wish to create an additional thread as I saw this thread was still here and my post does technically pertains to this. 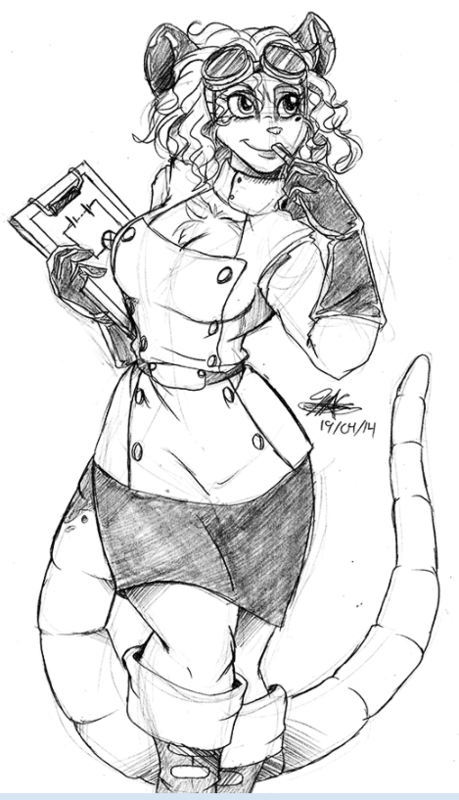 After cleaning out the vast majority of my computer, and getting a nice gift too from today, I got quite a few Patreon sketches. So here they are! Patreon #2: To be fair, someone had to clean it up. Who better than everyone's favorite White Guy, STEVE! Patreon #3: Jane and my lovely OC from Project GENESIST, Princess Luna, getting ready for a night out on the town. Patreon #4: My human OC from Project GENESIST, AMP, and my weasel OC, AMP, staring at one another. Patreon #5: Princess Luna made a new friend. Sitala is not amused. Patreon #7: Someone had to ship these two leaders. Patreon #8: Tina showing Sitala her old outfits. Patreon #9: Sitala versus AMP! Might as well stick my recent ones here as well. And Alex's ferret war dance. OOOHHHHHH! So that’s what that was then. I was confused as to why anyone would be eating breakfast in the air like that. XD And I was surprised Angel wasn’t the one to pull this one on Tiare. HURRAH!!! It’s Random Weasel Pillow War! And this is the end result of Mr. AMP constantly asking for unusual situations featuring Ben and his legendary pink towel. Were you just looking at me? And here we have Ben's incredible hot sister! DAMMIT MR. AMP! THAT IS MY SISTER!!! Seriously though, this is in fact Ben's sister. Well, at least one of his sisters. From what I've heard from Avencri, Ben has like four sisters in all. And he's the oldest. That Ben face deserves an animated gif. And this continue the Ben madness with an all new image featuring an idea that @Cervelet 's Addictive Science inspired.